2 by 3 Heroes: Trade #ocho: Hü Dü Photoshop? Challenge! (can you just hear the echo?). Well, Weston prompted this trade, finding some wants out of my 2012s. I dug around, found some Topps and A&G of his personal collections, mailed them off. 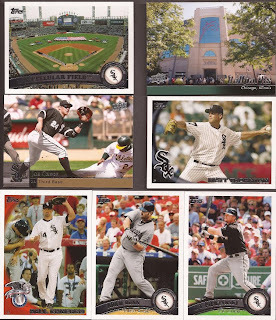 Weston did a great job with my macro "any White Sox cards are fine" (after I fixed that damn macro). There are a ton of great cards in here, but I'll just highlight a few. 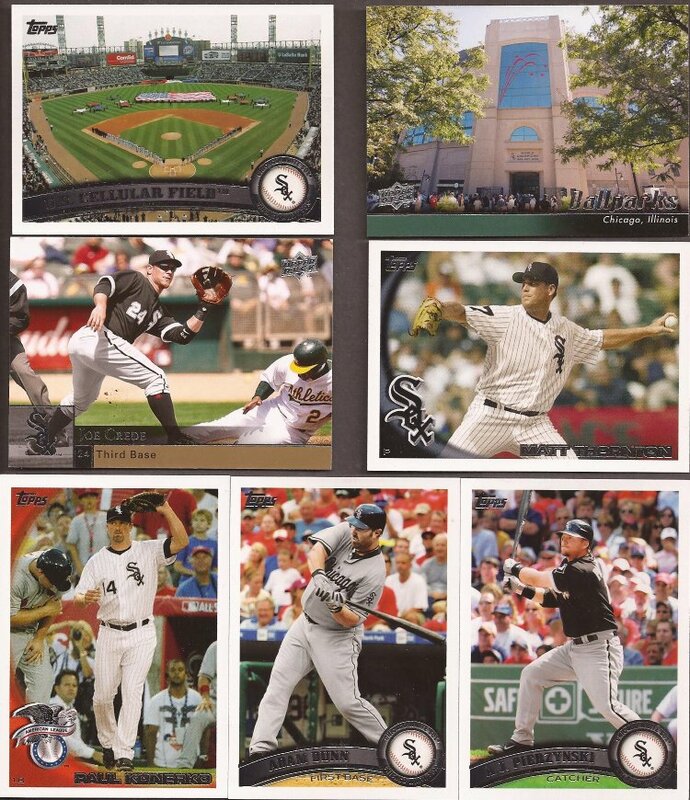 I can tell you they are all 2010 or 2011 Topps White Sox (with the team set - SWEET) and some UD Sox added in. While I may have a few of these cards (and by few, I am going to say 2, maybe 3), I am glad to get them all so I don't have to search boxes to get them organized. So here's what I see as the best. There's at least one in here photoshopped, maybe two - let's talk here. Two Cell cards - HOW IN THE HELL DO I NOT HAVE ANY OF THESE YET? I'm a collecting idiot sometimes. No, that was not an opportunity for you to chime in. Be quiet and keep reading. I love me some Crede. New project going to be added for sure - Joe Crede. You can see the so-so photoshop of Dunn in the bottom row. But what I want to focus on is the Matt Thorton card center right. Just a card, right? Anyone (besides you, Law) see what I am referring to? If you gander lower left at Pauly, you may see what is missing, as well as what is there. Ok - time is up. For starters, Matt is missing the front uni number on his uniform. If we take a look at the BHOF database (which is fairly accurate), since the Sox came up with this uniform in 1990, the numbers have always been there and still are to this day. Part two of that card - what is that #7 doing on his right sleeve? The only item ever on that sleeve was a Comiskey patch and World Series champ patch. Never, ever a number. And certainly not a number in the incorrect font (you can see the serif on the top of the 7). This is a 2010 Topps. The only other team Matt was on was the Mariners - back in 2005. So what's up with this card? 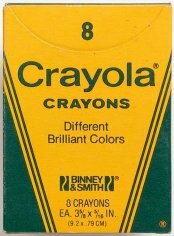 I am about to lose sleep over this! I can find no minor league rehab assignments for Thornton. And the more I look at this card, is this Matt on the front? So how about a little help, folks. At least stay up the might with me - we can listen to records. "Finish the set - could you be the one?"